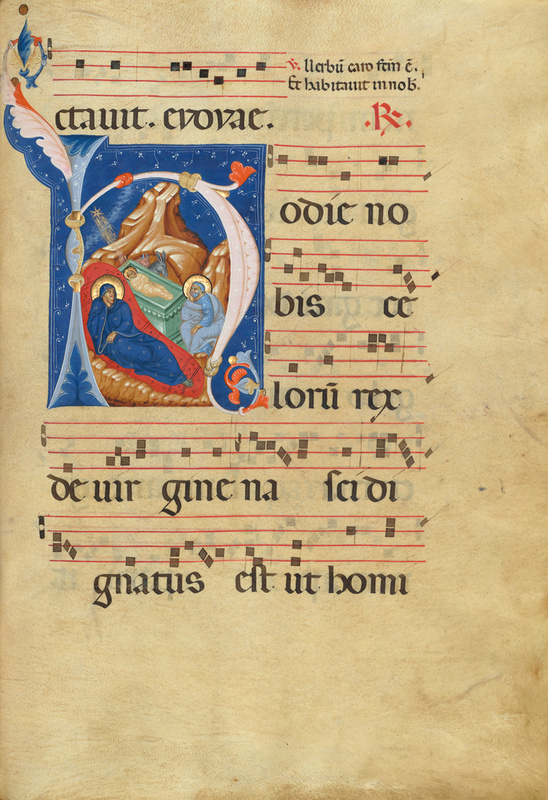 The H on the left side of the page introduces the chant Hodie nobis celorum rex (This day unto us the king of heaven), the first elaborate chant for the predawn service on Christmas. The representation of the Nativity within the enlarged initial heralds the theme of the chant, the celebration of Jesus' birth. The Virgin Mary, depicted in a traditional reclining pose, and Saint Joseph, seated to the right, seem lost in contemplation of the swaddled Christ Child in a sarcophagus-like crib, a reference to his future sacrifice. Jesus directs his gaze above, where the star followed by the Magi appears as a comet whose tail leads back to the baby. Apocryphal texts described the rocky, cavelike setting and stable animals whose heads appear behind the manger. The massive, draped figures and the relatively deep, three-dimensional space are characteristic of contemporary Byzantine art. Students make a class alphabet book using images of animals to illustrate each letter of the alphabet in the style of a medieval manuscript.